Targeted at micro business owners in developing countries in Southeast Asia. Vistaprint, the sixth largest public-listed printing company in the United States, has just gone small by launching a simple-to-use website builder called Vistamobi. It’s a novel product, especially because it comes from an unlikely source — a firm more well known in Europe and the US for printing namecards than mobile innovation. But the powers that be at Vistaprint are embracing entrepreneurship from within. Vistamobi is created by a lean four-man team stationed in Singapore, headed by Maliha Quadir, digital director for global emerging markets. Revenues are not a concern for the team at this point; they are more intent on acquiring users, getting feedback, and iterating. Vistamobi is unlike Wix, Yola, and Weebly in two important ways. First, it is build from the ground up to be mobile friendly, an important feature in emerging markets since many people have mobile phones as their first and primary computing device. An illustration of this can be seen on Vistamobi’s desktop and tablet interface. Whenever an update is made to their website, users will see a preview in a virtual mobile phone screen. In this view, they can pick from a variety of mobile phone makes that are popular in their countries. Second, Vistamobi websites are optimized for low bandwidth, which again is crucial since Internet connection speeds in these countries leave much to be desired. As such, the websites that can be created are designed to load fast and take care of the basics. The product is catered to micro business owners and SME bosses who don’t possess HTML knowledge and don’t how to use more advanced CMS systems like WordPress, let alone customize it to their needs. But it does cover the basics: Created websites are responsive, possess analytics, and are SEO-friendly. Some limited customizations are available, although custom URLs aren’t enabled yet. Some interesting use cases have arisen which step beyond retail and e-commerce businesses. Since soft launching in Indonesia about a month ago, consumers and students have started using Vistamobi to create their own sites. Student boy bands are getting in on the act too, adding links to SoundClould on their websites. It seems that people still do want their own .com despite the advent of social networks like Facebook and Twitter. Vistamobi has so far launched localized sites for India and Indonesia. While it is targeting emerging markets in South Asia, Maliha says that they are also looking at catering to business owners from developed economies, who may desire more bells and whistles. Despite the availability of so many easy-to-use website builders out there, tech companies still believe there is room in the market for another product. Infinite.ly from the Philippines, for example, believes it can ride on the wave of new Internet users that are joining the pile in the emerging economies. While it doesn’t have clear differentiation, its founder says that it is just at the beginning of its product roadmap, with vertical-specific features being part of the mix. Another new website creator to watch out for is Burpple’s Pages — which enables restaurant owners to create their own websites in a snap. 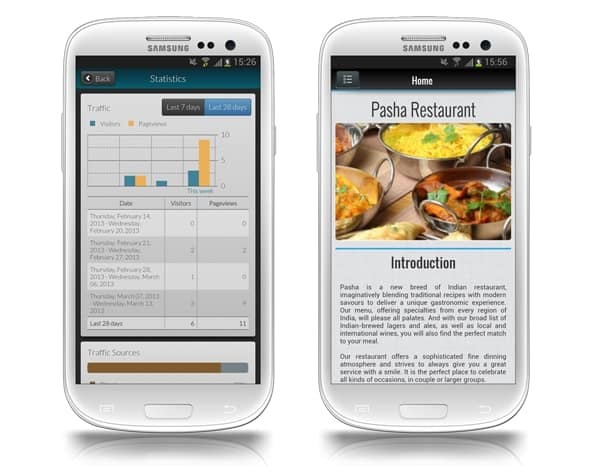 What’s special about Pages is that it leverages on Burpple’s mobile social network to promote the restaurant’s food. It also has F&B specific features like interactive menus as well as online reservation, takeaway, and delivery options. These companies are responsible for just a slice of the action in the online presence-building space. With the next Billion users slated to come from Asia, it’s no wonder many firms, from startups to MNCs, are hoping to win over business owners in this part of the world.